Devon International Group (DIG) gladly attended the 2015 CEO’s China Operations Club last month. 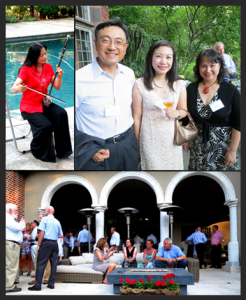 This year’s event was hosted by DIG’s CEO, Dr. John A. Bennett, and his wife at their estate in Villanova, PA.
CEO’s China Operations Club, an annual event hosted by the World Trade Center of Philadelphia, offers great opportunities for companies to share peer-to-peer experiences gained from years of conducting business in China – one of the world’s fastest growing economies. Every year, executives from more than 30 member companies get together to share best business practices, identify market trends and industry opportunities, and build business relationships and partnerships in a relaxed fashion along with immersing themselves in some fun culture exploration. This year, a world renowned musician, Min-Xiao Fen, kicked off the event with some beautiful Sanxian pieces. Devon International Group currently operates in 20 countries and is presented in 85 countries across the globe. We are headquartered in King of Prussia, PA and in Shanghai, China to offer quality products and services at affordable prices for the masses – from healthcare, IT , medical devices to office furniture. If you are interested in any of the Devon companies, please do not hesitate to contact us here or comment below.